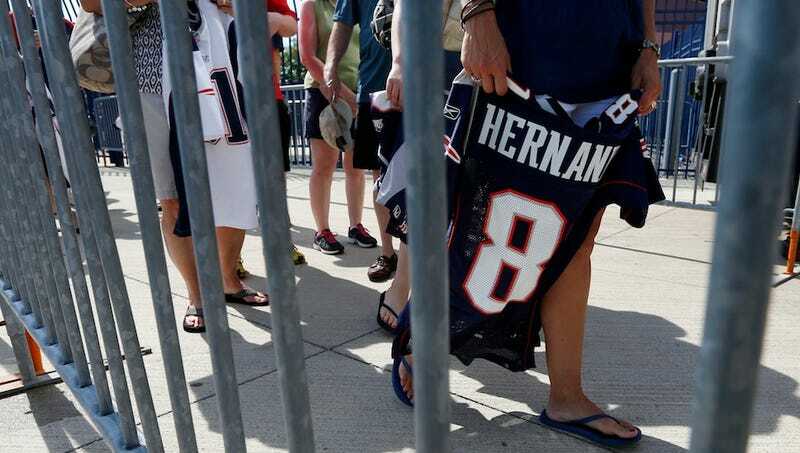 More than 2,000 Patriots fans lined up outside Gillette Stadium in 90-degree temperatures, as the Patriots gave fans two days to trade in their Aaron Hernandez jerseys for something a little less criminal. But who would be the most popular replacement? An exact count of exchanged jerseys hasn't yet been released, though the team estimated that 1,200 people showed up on Saturday (500 of them before 11 a.m.), and a manager at the Patriots ProShop told us "probably about the same" number of people were there yesterday. Impressive, considering Hernandez jerseys can fetch a few hundred dollars online. Vince Wilfork jerseys were the most popular for fans, who first had to hand in their Hernandez No. 81 jerseys at a tent for a voucher, good for one new jersey of equal quality inside the ProShop. Tom Brady jerseys weren't far behind. The manager at the store told us Rob Gronkowski and Rob Ninkovich were also hot sellers. Where's Tebow? A victim of the supply chain. This poster shows the jerseys that were in-stock over the weekend, and it was a fairly limited selection. Just 11 different Patriots were available in replica jerseys, and for "authentic," youth, and women's jerseys, only Brady, Gronkowski, and Wilfork were on offer. If you want a Tebow Patriots jersey, you're going to have to pay for it the old-fashioned way. "You can't wear a Hernandez around here. He disrespected the Patriots way, Robert Kraft, Myra Kraft. You can't disrespect her," he said. "I made a mistake getting a Hernandez in the first place. I should have bought Gronkowski, and I wouldn't be here now." “I am here because Aaron Hernandez betrayed us,” Josh said, “he betrayed every Patriot fan who was loyal to him, who invested their time and belief that he was one of us. I want him to know that such a betrayal comes with a reciprocal price." And still others were there because their wives made them come. "I liked Hernandez. I wanted to keep my jersey," said one man who didn't give his name. "There was no way he was keeping that jersey," said his wife. So what will become of all the traded-in Hernandez jerseys, along with the unsold quantities the Patriots still had in-stock? The team says it is looking into the possibility of recycling the material, but if that doesn't work out, you won't be seeing 81 on the backs of Burundian children. They won't be donated overseas; they'll be destroyed.